FITCHBURG -- Patrick Mehr, a leading advocate for legislation that would make it easier for municipalities to take over utilities from investor-owned operations, says management decisions are a key factor in why private electric utilities cost more than public ones, and that the numbers are on his side. There are some difficulties in comparing investor-owned utility companies -- IOUs -- with municipal-owned utilities -- munis. Each has costs that can be broken down into supply, transmission and distribution, but the IOUs have additional costs as well. SENTINEL & ENTERPRISE / BRETT CRAWFORD Blaine Bishop, foreman for Lewis Tree Service, takes down branches on Flynn Road off of Reservoir Road in Lunenburg while trimming trees for Unitil. Supply is the cost of the power itself, and neither IOUs or munis mark up that price. Transmission is the cost to get the electricity from the power plant to the customer. Distribution pays for the day-to-day operations, from employee salaries to maintaining equipment. In addition, IOUs have to pay transition costs to make up for costs for a restructuring act two decades ago, most of which goes toward paying off power plants. There are also energy efficiency and renewable resources funds that are rewarded to customers who install clean energy projects. "The distribution charges, in our view, is the core reason why cities and towns ought to have the right to form a muni by acquiring at fair value an IOUs assets," said Mehr. "Munis are simply more efficient at running the local distribution network." Mehr, who organizes the Massachusetts Alliance for Municipal Electric Choice, said he considers those energy rebates part of the distribution cost. Alec O'Meara, spokesman for the Unitil IOU that serves Fitchburg, Townsend, Lunenburg and parts of Shirley and Leominster, said otherwise. "Those are all stand-alone line items within the bill, as determined by the Department of Public Utilities," said O'Meara. He said lumping in those costs makes it an unfair comparison. In addition, 6 percent of the distribution cost goes to property taxes, something munis don't pay because they are owned by the town or city. However, most utility companies pay what is called a payment in lieu of taxes which is roughly equal to property tax rates. Using the state's standard of 650 kilowatt-hours, a monthly Unitil residential bill comes out to $116.38 with the newly adjusted rates from lowered electricity costs. Of that, $42.76 pays for what O'Meara considers distribution costs. By adding energy grants and residential assistance to impoverished customers using Mehr's method, the distribution cost increases to $53.34. Mehr compares that to a $17.01 distribution cost per month for the muni in Groton and $12.03 per month for the muni in Hudson for the same amount of electricity. Both of them make payments in lieu of taxes. Mehr and other critics say part of the difference can be explained by profits for the company, and profits for the company's investors, each of which is $4.28 of the distribution cost. If profits are subtracted from the distribution cost, leaving behind the same line items munis have to provide, the operation still costs $34.20 each month, twice that of Groton and three times what Hudson charges. "I think Unitil is an extreme case, they are exceptionally poorly run," said Mehr. National Grid is much more in line with the munies. the company gave their monthly distribution cost as $21.50 for 650 kilowatt hours and that amount does not include energy credits or residential assistance, but does include profits. "I really wouldn't be able to speak to what other municipalities do," said O'Meara. "As with any utility in the state of Massachusetts, we are highly regulated and go through a process with the DPU. "That's something I can't understand," said Kevin Kelly, manager of Groton Electric Light. "We don't have any of the economies of scale, so how are they double or triple our rate? I don't know where the money goes." He added that because the customers are the owners, there are no profits and all surpluses are invested back into the company. Kelly said his utility doesn't cut corners. They have good customer relations, keeps the phones well-staffed during emergencies and provides the non-union line workers with high wage and benefit packages. "Being non union, that gives us tons of flexibility," said Kelly. He estimated that not using union wages can save them 10 to 20 percent at the most, which doesn't completely explain the difference. He said without restrictions on what tasks workers can perform, his crew of six linemen, one supervisor and one meter reader can rise to any challenge. 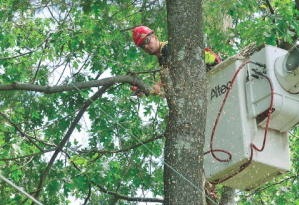 A report from the New England Center for Investigative Reporting estimated that IOUs in the state have on average three or fewer linemen for every 10,000 people in their service areas. Munis had an average of a little less than four linemen for every 10,000 residents.